February 28, 2014 by Dreamz Unlimited! Monali Thakur, who sang many superhit songs and recently won her first Filmfare for the song Sawaar Loon (Lootera), is now all set to build her new career as an actor. We still adore those songs of Iqbal, a Nagesh Kukunoor film. Many took inspiration from Aashayein. Songs of Lakshmi are no different. Though they are not inspiring, but soothing, pleasant and innocent. Music of the film is by Tapas Relia who previously has done background scores of movies like Ferrari Ki Sawaari, Kuchh Love Jaisa and few animated films. Manoj Yadav, who impressed everyone with his work last year in songs like Har Kisi Ko, has penned the lyrics. 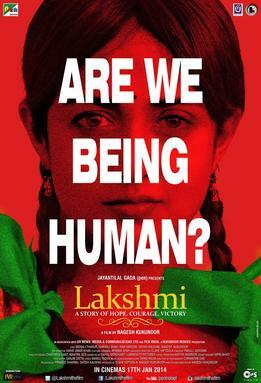 CLICK HERE to buy Full Soundtrack of Lakshmi from iTUNES!!! It’s a sort of qawwali which gives a heard-before feeling but the instrumentation is fabulous. Tabla plays a prominent role and is played briskly throughout the track. Guitars and Drums also give a valuable support to it making the song sound really amazing. Kailash Kher is always perfect for these kind of songs. Recording as in mixing, could have been better as the instruments, apart from Tabla, are not sounding clearly. Manoj Yadav’s lyrics and good instrumentation improve the level of this average-tuned song. It’s a folk-ish melody which gives a traditional Indian flavor and the lyrics written by Manoj Yadav has that beautiful essence of rural soil. Singers do the icing on the cake. Suchi, who still hasn’t recovered from the superb success for her latest track Desi Romance (Shaadi Ke Side Effects), has sung brilliantly, making the listeners taste every bit of the song’s melody. Ankita Joshi, a trained classical singer, also the disciple of The Great Pt. Jasraj, has made her Bollywood debut in an experienced gesture. Enthralling Flute and Shehnaayi at regular instances with the continuously played Mridangam would make you feel patting Tapas Relia. A must listen for the ones who love soft folk. If the Flute had a remarkable effect on your ears, it’s time for Saarangi to impress you with its sparkling overlaid tune. The leading lady of the film does here what she is known for. Her voice sounds innocent but confident at the same time and also trained, in this semi-classical melody where Tabla aptly and faithfully supports her. Besides Tapas Relia’s melodious tune, Manoj Yadav’s lyrics again gives that retro feeling which is not often heard these days. Give it a listen for sure! Lakshmi is a small, lovely, ear-friendly soundtrack that peeps out innocently in the midst of all the big commercial albums but it has the potential to reach to those for whom it is desirable. All the four songs have a particular kind of maturity and innocence too. Singers, instruments and lyrics have a great coordination among themselves making it pleasant for the listeners. This Tapas Relia – Manoj Yadav combo has turned out to be the most promising composer-lyricist jodi of Bollywood. A soundtrack that contributes well in purifying the current Bollywood lyrics standard.